Noel Coward's famous observation about the topography of Norfolk may apply to the west of the county or the marshland south and east of Norwich, but not here, near the north east coast. The land builds to the coast, swelling and rolling like waves, to be cut short into cliffs by sea erosion. A couple of miles inland, St Margaret sits in a cohort of trees on the brow of upland, fields all around, hardly a house at all within a mile. Most of the churches in this area had their round towers replaced in the 13th and 14th century, but St Margaret still retains an interesting one, as we will see. 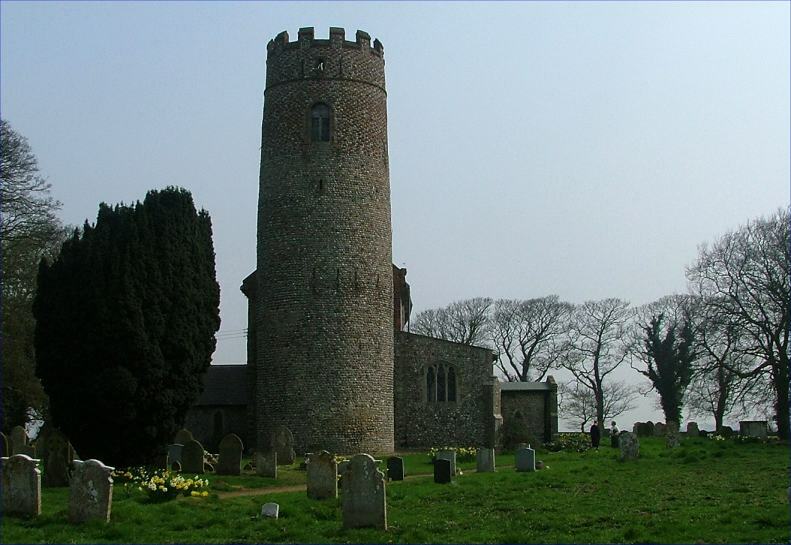 Somewhat confusingly, Norfolk has two Wittons, both remote, and both which churches dedicated to St Margaret. This one is sometimes referred to as 'Witton-by-Walsham'. Its church is an elegant, well-kept, peaceful building, but it is also rather quirky. There are some things here you won't see elsewhere. My eye was immediately caught by two splayed round windows in the lower north side of the nave. Mortlock says they were uncovered by the Victorians, which usually sets a few alarm bells ringing; but here, I think they are genuine Saxon windows, and this is a genuine Saxon piece of wall. As is the lower part of the south wall, for both sides have long and short work ironstone blocks forming the corners with the west wall. This wall was clearly intended to be flat, and the tower is built separately from the church. Because of this, we can safely say that the body of the church was built before the tower, which may be Saxon, but is probably early Norman. In the early 14th century, they began to expand the church, but rather than rebuild it they heightened the existing walls, which is why the tower and the church still make an awkward juxtaposition even today. There is a clerestory on both sides of the church, but an aisle only to the south, contemporary with the clerestory, rather than with the 15th century crowning of the tower with a bell stage and battlements. Why no north aisle? Perhaps it was never intended, but perhaps the Black Death intervened, and lack of resources meant it was never built. When the Tudors extended the tower, they needed a way for people to get up to the bell stage. Rather than build a stairway inside the tower in the conventional manner, they built a stair turret inside the church, against the west wall of the nave, which is at once awkward and intriguing. Tucked in beside the stair turret is a large converted barrel organ. Tom observed that villages usually owned just one barrel organ, which was used in the church on Sunday and then moved to the pub for the rest of the week. You hope they didn't get the tunes mixed up. Otherwise, the hands of Georgians and Victorians are responsible for the furnishings, although the bench ends are actually cut down medieval ones, and there are some fine early 18th century box pews in the aisle. The sedilia in the chancel is superb - or would have been. But a 19th century window splay has cut one of the seats and the original piscina away. Don't miss the extraordinary early 18th century monument to the wife of John Norris. It couldn't be less symmetrical if it tried, and you can just decipher the names on the spines of the books piled up on the right hand side, the Bible and Shakespeare among them. A big and interesting church. It is one of the few around here to be kept locked, presumably because of its remoteness from civilisation, but the churchwardens are very happy indeed to let you in and show you around.